The impressive arches of the gateway to the city, Portas da Cidade is located on the Praça Gonçalo Velho Cabral. 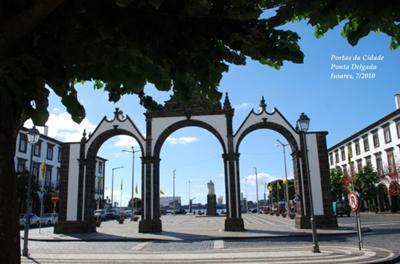 This praça (square) is named after the Portuguese navigator who landed on the islands of São Miguel and Santa Maria in 1432. Rob's reply: I love those arches. They are found in Ponta Delgada at the avenue. PS Looking forward to more pictures! The arches are beautiful, all of São Miguel is outstanding.